Rising at the top of the picture is the unmistakable tower of St George's Bloomsbury, but I had long forgotten the exact location of the Regent Lion Filling Station. I took it as the first of four frames before getting to St Chad's St in the area to the south of King's Cross, and I had long thought this picture must have been near there. The company was incorporated in 1955 and appears to have been dissolved some time in the 1990s. 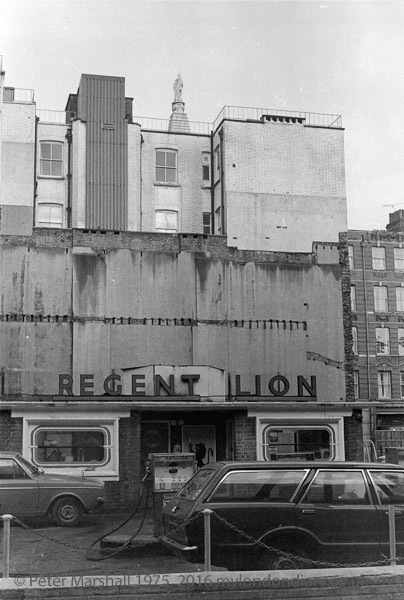 The Regent trademark had a long history in petrol outlets, beginning with Burt Boulton & Haywood, a small independent distributor who had a wharf and chemical works at Prince Regent's Wharf which is now the Thames Barrier Park. They were bought up by Trinidad Leaseholds in 1930, and post war they merged with Texaco and later Caltex, reverting to Texaco in 1967, who discontinued the use of the brand name for most of the outlets, though it was revived for special uses in 2004. The Regent Oil Company were also on Canvey Island and the site changed its name to Texaco at some point but is now closed.